My friends … I am excited about what I saw from the Oregon Spring Game. It has become evident to me that we are on a path that will someday take us to a National Championship. Now you know me: I am admittedly an insufferable fool for the Ducks, the classic homer fan. That said, I do have the GOC (Grizzled Ol’ Coach) teaching me valuable components of Brady Hoke’s 4-3 defense currently under installation in Eugene. While I am no authority, I am delighted to pass along what I have learned from the GOC to you. The Ducks did not have all of their weapons displayed on offense and were hampered by the scant set of plays allowed during this glorified scrimmage. However, the defense was also handicapped by the inability to use its full arsenal of weapons. Further, the defensive starters were stretched out among the two squads, and they are still in the early stages of learning an entirely new scheme. Yet I am beyond encouraged – I am excited. Let’s see why. This is the beginning of the ‘Green Wall” my friends. The image above illustrates the change Oregon is making on defense. 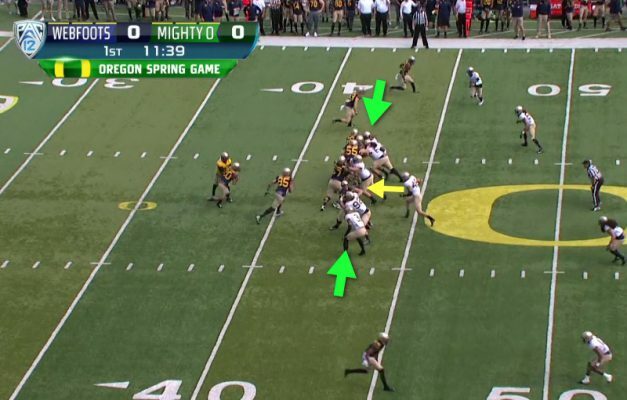 With the two gap 3-4 defense, the Ducks’ defensive linemen were not supposed to penetrate the line of scrimmage. They were supposed to hold their ground, control the blocker and allow the play to develop in front of them. Once they diagnosed the play, their job was to slide across the face of the blocker in pursuit along the original line of scrimmage (“LOS”). In contrast, in a one-gap scheme the coaches want the defensive linemen to penetrate their gap as fast as possible while driving the offensive lineman two yards backward! The D-lineman should drive through the outside shoulder of the offensive lineman so powerfully (within his assigned gap, of course) that the O-Lineman must give ground. He is not trying to stay with the blocker, but blast through and control his gap, and then read where the play is going. The linebackers then fill the gaps the defensive linemen do not. The intent is to create a wall, making the running back bounce to the outside so the defender on the perimeter (the “edge” or “force” player) can make the play, or turn the runner back inside to the swarming one-gappers in pursuit. 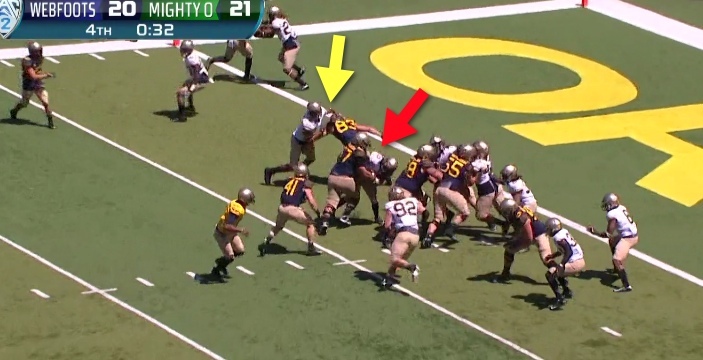 Above you see a wall created with only one gap open, and that is being filled by the middle linebacker (MIKE, yellow arrow) so that the wall is complete. Look at the picture at the very top of the article, and you see Canton Kaumatule (No. 99) ready to take the outside gap while the gap in between is where the running back is cutting to … right into the linebacker (Blake Rugraff, No. 53) and thus the wall is secure. Oregon DID do some blitzing! And just when the offensive linemen are getting used to being attacked on their outside shoulder, Oregon will mix it up! Above is a perfect example. Here, the D-linemen are exploding into the inside of the offensive lineman to penetrate the inside gap. You see how all gaps along the LOS are taken and the Ducks are actually in a six-man blitz! You will want to watch the third yellow arrow from the bottom on redshirt freshman Drayton Carlberg, as he has the jump on the inside gap of his blocker. There will be high-fives in the film room as the LOS collapses (above). Drayton has penetrated four yards deep, found the running back and is about to make the tackle! This is precisely what coach Hoke is striving for and it came about due to mixing up technique, attacking, and being unpredictable. 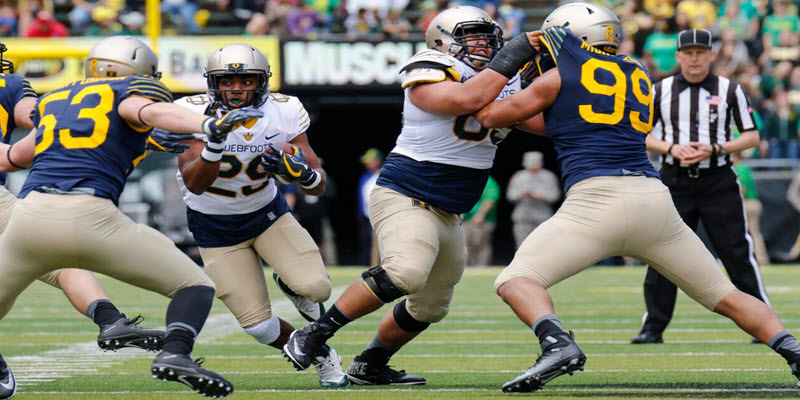 The above video is how you put offenses into long-yardage situations that create punts, turnovers and more time for the Oregon offense! Things are set up for an easy Power Play to score. The two-point conversion attempt to end the scrimmage was another superb example of the Oregon front seven forming a wall, which showed their ability to beat blocks in crunch time. Above we see the beginning of the play. One of the major players to watch is the pulling guard, Doug Brenner (No. 57, green dotted arrow), who is going to lead the running back into the hole for a Power Play. He is going to meet De’Quan McDowell (No. 54, red circle above) in the key gap while Justin Hollins (No. 11, yellow arrow above) has to beat his block from the tight end to secure the edge. The defenders create the “Green Wall” to win the game! McDowell (red arrow above) recognizes the Power Play immediately and knows that his team will lose if the running back has an open hole. Indeed, the Ducks have scored with this play countless times over the years. De’Quan must come up and blast the offensive guard with his inside shoulder and somehow plug that gap by taking on an offensive guard with 80 extra pounds of horsepower. While the technique is not pretty, the results are huge as McDowell plugs this gap and forces the running back to bounce to the outside! After the 2014 National Championship game I did an analysis on the bad angle an Oregon linebacker took that lead to a Buckeye touchdown. By contrast, look at what De’Quan did on Saturday compared to that play a year and a half ago. That difference is what wins games! For the detailed oriented, Justin Hollins (yellow arrow above) is playing a “9” technique, and must defeat his block to the outside and set the edge. GOC explained that often the defensive ends in Hollins’ position will wait and wait in the old style of defense, and if Justin tried to simply control the block–he would have lost yardage and not have been there to make tackle on the running back bouncing to the outside. By penetrating his “D” gap he created a great angle to make the play inside the LOS instead of sitting a yard back. 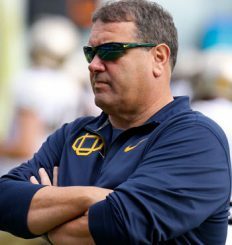 My friends, China may have the Great Wall, but Brady Hoke is certainly in the early stages of building Oregon’s Green Wall on defense. While Coach Hoke feels there is a long way to go in implementing his new defense (and I have no doubt of that), I am excited to see the first baby steps of the new 4-3 that can one day take the Ducks to their ultimate goal. I would love to take credit for this analysis, but the truth is that everything above is from the Grizzled Ol’ Coach, Mike Morris, and I am fortunate enough to be able to learn from him and pass this along to you. We as fans will be learning a lot about the new defense over the next six months at FishDuck.com, and thus enjoy the journey that Oregon is on that much more.